My favorite things about podcasts are the portability, variability, and niches of content available. I’m constantly amazed at the on-demand quality that’s available to me. As someone who grew up listening to Casey Kasem for hours, so I could tape the one song I wanted, this is luxury. Podcast episodes automatically download to my phone and nearly every dog walk, short run, and road trip has the sound of a podcast. One of the podcasts I enjoy is the James Altucher show. Altucher consistently has guests that impress or inspire me, and I found that I was often jotting down notes while listening. Then a website idea occurred to me, why not turn my notes into something everyone could read? In my rough drafts I was making all sort of connections and I thought that maybe other people might find them interesting. I’ve written up some of the recent guests of the show and thought people might be interested in how I do this. I enjoy seeing how other writers write, so here I’ll show how I do it too. October 17. After a long day of school, writing, swim team, meetings, and getting our kids to bed, I (and the dog) was due for a walk. On especially busy days our young maltipoo will be quite crazy if I don’t take her for a walk. Plus, walking is awesome. Before heading out I always update my podcast feed and saw James’s interview with Simon Rich pop up. After the episode downloaded, I turned up the speed to 1.5 time normal and headed out. I’ve found that this is the best speed for letting an interview run through my mind and just seeing what sticks. On this walk I listened to about half the episode. October 18. I finished the Simon Rich interview on a run. As I listen, I try to think about connections or comments I might make, but take no notes. Listening all the way through gives me an idea about the flow of the conversation and what sort of structure my notes may take. One time I tried to read the transcript first, but that didn’t work. Too much of the conversation interplay was lost in the transcription. After finishing each episode I let it go for a few hours and then begin writing the outline later that day or the next. 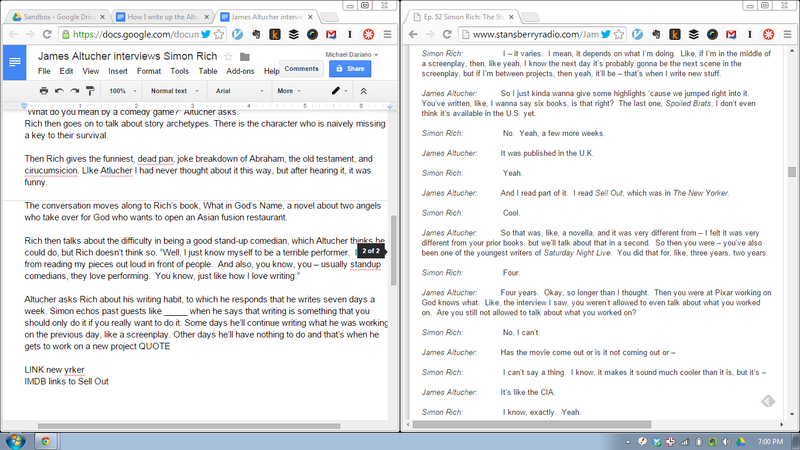 I have my document open in Google Drive on the left (here’s why I write in Google Drive) and the transcript open on the right. At this point I’m just trying to create the skeleton of the post and have the relevant things clumped together. For parts I need to look up later I’ll have comments to myself like “IMG” or “MORE” to show what I need to return to once the skeleton draft is completed. October 19. After pouring my coffee I began filing out the skeleton that I made the day before. After some experimentation and reflection I’ve found that this sort of writing work is the best for right after waking up. I feel a mix of creativity and objectivity. On the other hand I’ve found that this is the worst time of day to do any editing. Filling out the skeleton draft means to go through it and including anything I can think of that might also be relevant, in addition to filling in the parts labeled as “IMG” or “MORE.” I put these cues in during the outline because the most important thing then is to create an overall idea of the post. Outlining is like doing the perimeter of the puzzle. In the Simon Rich interview for example, he brings up SNL many times but in my review and summary, it made sense to have it together. If I determine where that point is during the skeleton outline, I can start to plump it up during this part. On this day I had time both in the morning and evening to work. At night found another forty minutes before dinner and nearly completed filling out the outline. The total word count at this point was 1546 words and I had invested about 2 hours and 20 minutes. October 20. Another hour in another morning and the draft is done. During this session I added relevant links and most of the spelling errors are now gone. I’ve looked at other websites to include quotes (how Stephen King gets ideas for example) and copied over quotes from Kindle books that have connections. I could push publish now, but it feels like I need to clean it one more time. I take a break while I make breakfast for the family and take my daughters to school. After that I stopped at McDonald’s to finish it up before joining my youngest daughter on a field trip. The totals. The post ended up at 1800 words and took 3 hours and 40 minutes from starting the podcast to sharing with James online. This time commitment surprised me and at first glance I thought this was a quite high opportunity cost. The last few books I’ve read have taken 4 to 5 hours to read and each was quite beneficial. Were these posts worth the time? But here’s the rub, in writing these posts I’m building on what I learn. I do a lot of reading, but unlike books being re-shelved at the library after I’m done with them, knowledge doesn’t work this way. To really know something I’ve read means I need to play around with it in my mind, and make connections to other things. I’ve linked to Scott Adams so many times I get it. On the other hand, there was a Stephen King story that I wanted to include in this post but didn’t because I couldn’t’ find it. That means i need to re-read On Writing so I better understand it. I hope you’ve enjoyed this post and if you haven’t yet check out The Waiter’s Pad please do. The interviews are great and you can see my thoughts on Scott Adams, Matt Stone, and others. Plus James Altucher has a great archives, my favorite interviews include Nassim Taleb and Dr. Wayne Dyer. Let me know what podcast you enjoy, @MikeDariano. This entry was posted in About Writing. Bookmark the permalink. Hi Mike, I really enjoy your blog. Just wondering, are transcripts usually available for most of the podcasts? How do you swim through a sunken submarine?